One of our top questions at 777-JUNK is “how much junk will your truck hold and how much will it cost me for you to haul away my junk?” We can answer your question in several parts right here. With 777-JUNK, you only pay for the space your junk takes in our trucks. That’s it! We do not charge truck or trip fees, personnel fees, or clean-up fees. All of that is included in your price that one of our 777-JUNK team members gives you once we see exactly how much junk you want us to remove. You can easily get a price estimate by using our online appointment scheduler. 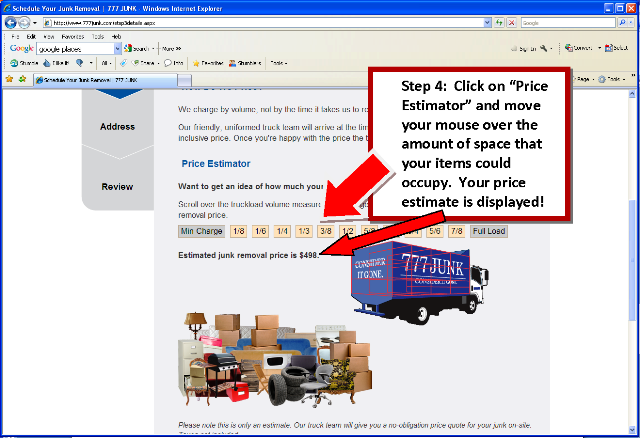 By just entering your zip code, you will then be able to estimate how much junk you have and want us to haul away. 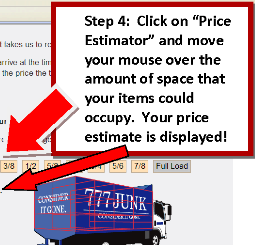 You can see in the illustration above how the Price Estimator works. In the example above, look how much junk we can haul away to fill one of our trucks! Remember, we can only give you an estimate until we actually see how much junk you want us to haul away! We accept local checks, cash and credit cards once we load your junk onto our truck. But you will know the exact price prior to any work being done! Click here to use our online appointment scheduler and receive a pricing estimate! Thank you for making 777-JUNK your locally-owned and operated choice for professional junk removal in Asheville and Western North Carolina. We appreciate your business over these many years! Over the years, 777-JUNK has removed and hauled away thousands of loads of unwanted and unneeded items from our customer’s homes and yards. We knew at the beginning of our business that we wanted to be good stewards of our environment, and that meant knowing what we could recycle and reclaim. You can help our environment, too. The next time that you schedule an appointment with 777-JUNK, please sort your items into similar boxes or piles. You will be doing your part to help recycle and reclaim items when our 777-JUNK crew members arrive at your home. Plus, if you have children, this simple lesson helps show them the proper way to dispose of unwanted and unneeded items! Please click here to use our online appointment scheduler or call 828-777-JUNK (5865). Our 777-JUNK customers enjoy the high level of service that has become our hallmark signature across Asheville and Western North Carolina. And we want you to know that we work hard everyday to earn your business and continue to be the #1 Local Professional Junk Removal Service! We book appointments in two-hour arrival windows and we’ll call you 15-30 minutes before the start of your appointment window to give you a confirmed arrival time. When we arrive, you simply show us the items you want removed and we’ll review the pricing with you and give you a clear estimate up front. With your approval, we’ll start work immediately! Our rates include all the lifting, loading, recycling and disposal fees and the best part is you only pay for the space you need. We’re not able to give you an exact price until we see how much junk you have for us to haul away, which is why we offer a no-obligation FREE estimate, but you can get a general idea of the cost using our online scheduler. We make doing business with us very easy, convenient to fit your schedule, and we offer affordable junk removal servces. Click here to use our online appointment scheduler or call us at 828-777-JUNK (5865). Thank you for your continued business, and we look forward to serving you soon! Asheville Moving Leads to Asheville Junk Removal! Are you moving this summer locally, to, or away from Asheville or Western North Carolina? When was the last time you moved? Have you accumulated too many things?! 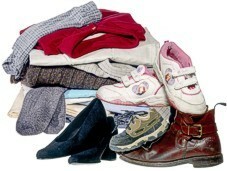 Does the thought of moving all of your unwanted stuff to your new place bother you! 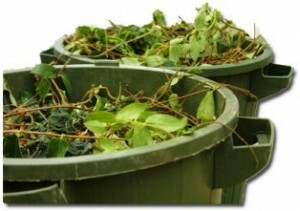 777-JUNK is the perfect choice for junk removal to help you haul away unwanted items before or after you move. Have you ever noticed that moving time is the perfect time to take inventory of everything you own and decide easily what to get rid of! Moving is stressful enough without having to decide which of your old stuff you want to take with you! Moving time is the perfect time to call 777-JUNK or easily schedule an appointment with our online scheduler. - Boxes and boxes and boxes of old stuff! The only things that we are not allowed to haul away include items that are flammable or poisonous. Everything else is fair game to be hauled away during your move! Click here to schedule your online appointment. Or call us at 828-777-JUNK (5865). You only pay for the space that your stuff takes in our famous blue trucks. Trust the experts that your neighbors have trusted for years…777-JUNK!